Like many before us, we’ve spent time and effort trying to improve our application performance, mostly by tweaking our PostgreSQL database indexes and SQL queries but then we wondered what more could be done, so we built Stored Procedures in PLLua with excellent results. The following article aims to introduce PLLua [http://pllua.projects.pgfoundry.org/] and make a brief comparison with other procedural languages. At Newfies-Dialer [www.newfies-dialer.org], we build high capacity Voice Broadcasting systems and in our current stack, we use Celery [http://www.celeryproject.org/] to do post-processing after calls are hung-up. Our Celery tasks mainly log and aggregate the information from the call and do the decision-making required by our application. I’m not going to talk about Voice Broadcasting or telephony, but I do hope to explain how we succeeded in dramatically improving our application performance. We saw the potential for improvement if we replaced some Celery tasks by procedures and triggers built directly in PostgreSQL. We didn’t want to write PL/SQL as may fit well for basic function and triggers but once the logic is more complex it’s not a nice language to code. So after discovering PLLua I decided to experiment with it. Is Lua a good fit in PostgreSQL? First let’s compare community/usage around PLLua & PLV8. 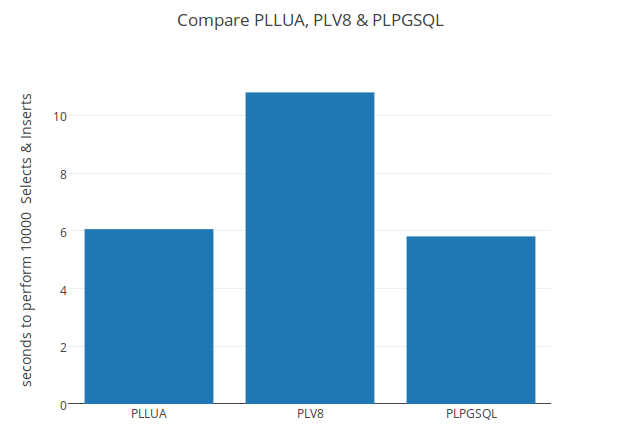 Let’s compare the performance of PLPGSQL, PLLua & PLV8, for this we will create the same function in each of the 3 languages and do some basic benchmarking on them. Our functions simply run an arbitrary amount of `Selects` and `Inserts` into a table. We could have written these functions in one single SQL query but we wanted to compare how the Procedure Languages perform, so although our examples make little sense it gives us an insight into how a language will perform for a simple function. PLLua is fun but PLLuau is even more fun. With PLLuau you have access to the full Lua environment, similar to the standard regular interpreter. Let’s build an example to illustrate the use of PLLuau; for instance let’s imagine you are building an application that needs to send an SMS after Customer signup. So on `Insert` in your table `User`, we would like to trigger an API Call. Before creating our trigger we will create a RequestBin (http://requestb.in/), which will make it easy to inspect and test our API requests that will be sent by our PostgreSQL PLLuau trigger. We have been using PLLua in our Voice Broadcasting system for a few weeks now, and I am very pleased with it. With PLLua we are able to build much more complex logic inside our triggers, keeping procedures fast and at the same time keeping the code readable and easy to maintain. It was easy to choose PLLua over PLV8, I was immediately convinced once we realised that the performance was good, and that PLLuau takes full advantage of Lua’s power inside postgreSQL. On the other hand I saw that PLV8 have a bigger community, so that might have an impact in the future. For instance, PLV8 has a remote debugger [http://pgxn.org/dist/plv8/doc/plv8.html] which is something I would love to see in PLLua. I hope this article will encourage you to try Lua programming [http://www.lua.org/start.html] and use it inside your beloved PostgreSQL Database. Leave comments or join the discussion on Hacker News [https://news.ycombinator.com/item?id=11352338].